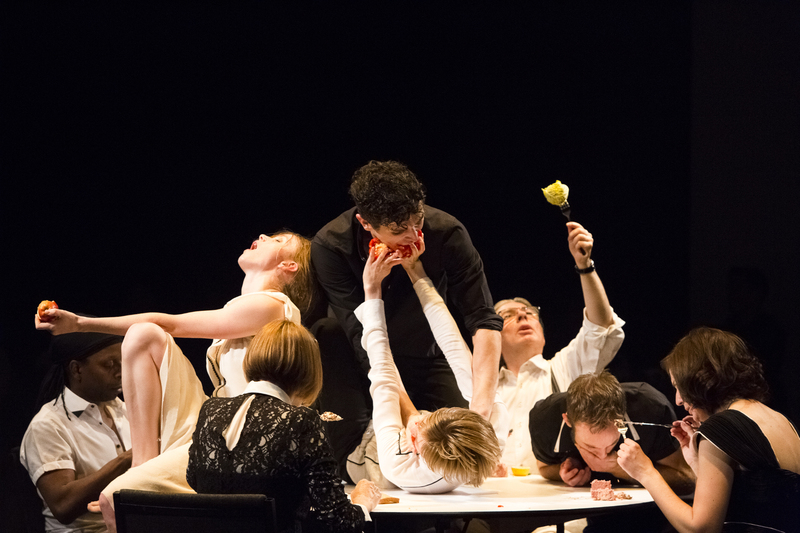 Eccentric, ludicrous and entertaining: Rachel Elderkin reviews Protein’s gastronomic new work. Protein’s May Contain Food at The Place. Photo: Alicia Clarke. Instead of the usual stage and rows of seating, a restaurant awaits. Tables artistically decorated with dried pasta and fresh vegetables are set in the round. You take your seat as you would for a dinner, the company of waiters ready to attend you. From the pleasure and sensation derived from food to addressing the more tricky debates around vegetarianism and genetic modification, Protein’s latest production May Contain Food explores our obsessive relationship with this necessary and much-loved social pastime. The menu on offer is a concoction of operatic choral song and dance theatre, presented by a cast of four singers and four dancers. The clever lyrics – conversational in tone, often satirical and somewhat didactic – are set to an a cappella score by Orlando Gough. The accompanying movement is less dance and more a physicalised expression of the words they sing. What’s refreshing about this work is that, for the most part, the roles of dancers and singers are equal and interchangeable. The skills of both combine to create a quirky, creative production in which the audience are invited to share – after all, food is often a social affair. Performer Carl Harrison guides the audience through their first course, instructing them on the prolonged process of eating a cherry tomato; postponing the moment of consumption and encouraging us to savour the sensation of this simple food. We are persuaded to feed rice balls to our neighbour and there’s an uncomfortable, but quite hilarious, moment where singer Donna Lennard becomes intent on baby feeding a few reluctant audience members. The production is not just a homage to food, although a spectacularly over-the-top grace elevates consumption to a reverential status. Through its song and dialogue it also tackles various food-related debates, including the conflicting opinions around vegetarianism, a debate on which everyone in the cast has a say. Lennard sings pleasurably of meat but, as she sidles across the white-tiled backdrop, she leaves a bloody smear behind her. As things become heated this carefully composed argument descends into a cacophony of noise amid the grunts, squeals and squawks of the company. It comes to a head as Harrison begins a football-like chant in support of pigs. It’s an eccentric, at times ludicrous production, but May Contain Food is at least one of the more unusual, and entertaining, experiences you’ll have at a dinner table. With the ginger pudding finally ready, its freshly baked smell wafting through the theatre, this brilliant cast conclude their frolic through the pleasures, and principles, of food. May Contain Food is on until 7th May 2016. Click here for tickets. Rachel is a freelance dancer and dance writer. She was a 2015 finalist in The Stage critic search and currently contributes to The Stage, londondance.com and international dance site, Fjord Review. She has written for a number of publications including The Skinny (Scotland) and LeftLion (Nottingham) where she was Art Editor.